Quiet roads, good pavement, warm weather, SUN, and lots of riding under brilliant blue skies. 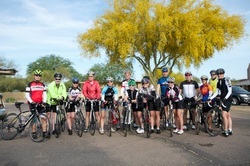 Join us for a week of cycling in Scottsdale, Arizona, a cycling mecca. Rides will be lead by experienced coaches who will offer insight on the area, feedback on technique and training, encouragement, and support. Massage, bike assembly and packing, group meals, and much more are included in this camp that will get you fitter, faster, and stronger; and we’ll have FUN too! The group will be limited to 20 riders. Check out pictures and videos from previous years. Details: Cycling Centre staff will greet you at the Phoenix airport and transport you and your gear to the Carefree Resort. While you enjoy lunch by the pool and check-in to your room, your bike will be assembled by staff. After a late afternoon spin we'll head in to Cave Creek for a group dinner. ​Ride Description: Easy 90 minute spin to make sure bikes are in good working condition. We will explore the roads through Cave Creek and Carefree. Ride Description: After breakfast, we'll begin our ride with a slight downhill, quiet urban roads, and a 16 km stretch on the Sonoran Parkway, a flat road with beautiful dessert views. The ride home will pass horse and cactus farms with the last 12 km slightly uphill. Riders will have the option of testing themselves on some 24% climbs just before stopping for lunch. Details: ​We'll stop at Local Johnny's for lunch before heading back to the resort. Afternoon activities will include a hike up Black Mountain for stunning views of the area, massage, and time by the pool. Group dinner will involve local hospitality. Ride Description: There is a little bit of everything on this ride! The route starts with a slight descent to warm-up the legs, has some fast rollers, then heads in to the Scottsdale suburbs where riders are faced with an 18% hill; a great challenge that is rewarded with spectacular views before a fast and fun 20 km descent! The last 25 km are on a false flat uphill home where riders are met at the end with a well deserved treat. Details: ​Riders can choose to stop at the 70 km mark and get a lift in the support vehicle. Optional afternoon activities include a run, exploring the wild west offerings of Cave Creek and Carefree, or lounging by the pool. Dinner will be together as a group in town. Ride Description: This ride has a challenging start as we ride uphill on a 4% grade but then the ride down to the lake is beautiful; and with the out-and-back route it allows everyone to ride at their own pace. One of the highlights of the route is the Tulissi Tail Gate where riders are greeted with smoked salmon, crackers, oranges, chocolate, and other goodies. The ride out of the lake is a 16 km climb, where finding a rhythm and enjoying the spectacular views is key to enjoying the day. Details: ​Riders can choose to have lunch in town or at the resort. Afternoon activities include time by the pool, a run, or shopping at the beautiful outdoor malls of Kierland Commons and Scottsdale Quarter before a group dinner. Ride Description: Two options are available today, a fun day on the dirt trails (extra cost for mountain bike rental) or a road ride. Every year mountain biking is a top highlight, offering a new perspective on the desert scenery, a nice recovery ride on well groomed trails, and an escape in to the quiet landscape. The road ride will be up the infamous Mt. Humboldt with some dirt roads and a 10 km climb over 10%, resulting in top of the world views of the surrounding mountains. Details: ​We'll end the rides at a local coffee shop for lunch and the sharing of highlights from today's adventures. The afternoon will have a final massage and time to explore town with it's unique western flare. Dinner is on your own with lots of excellent choices, including live music and rodeo at some locals. Ride Description: This ride offers breathtaking views around every bend. The long option is to ride from the resort to Tortilla Flat, a epic 140 km option and shuttle home. The shorter option is an out and back along the awe-inspiring curvy route. A break in the charming town of Tortilla Flat is a must, with unique and humorous sites abounding. Details: ​The shorter group will be shuttled 90 minutes to the start. Both groups will meet at the end as we have lunch at the Hitching Post, an eatery that the locals arrive at by horse back to enjoy lunch and a drink on the patio. All riders will shuttle back to the hotel where bikes will be packed up in preparation for tomorrow's departure. Dinner will be our final group meal at the Tulissi house. Today we say our goodbyes and make our way home having made new friends and wonderful memories. Shuttles will be arranged depending on flight departure times. Athletes with flights later in the day may choose to ride in the morning or explore the local town and pick up some last minute gifts and keepsakes. Airfare. We will pick you up at the Phoenix airport on the 15th and drop you off on the 21st.